The Desert Rose Resort provides guests with a classy and comfortable accommodation with the luxury of prime location. Only a block and a half off the strip, the resort provides quick access to all there is to see and do. The Desert Rose Resort separates itself from the competition as it offers a full kitchens and private balconies or patios. This adds a level of convenience, other accommodations cannot compete with. The resort also offers free parking and helps you stay connected with free WiFi. One would think with so much to do in the surrounding area, there would not be a need for the Desert Rose Resort to offer many amenities to their guests. This is not the case as the list of amenities is extensive. The resort amenities include a pool and hot tub, complimentary WiFi, fitness center, local golf courses, BBQ area, 24 hour front desk, free parking, concierge services, convenience store, and laundry facilities. With 650 square feet of space, the one bedroom condo suite is spacious for the up to four guests it can accommodate. Luxury is a strong focus of the resort, as the condo suite is equipped with a full kitchen with full-size appliances, granite countertops and cookware. The full kitchen with a well-appointed dining room, can help add affordability to a vacation where expenses can add up quickly. The king bed also has a plush pillow-top to make your nights rest as enjoyable as possible. What does Las Vegas not have to do? Everything you could think of and more is offered in Las Vegas. 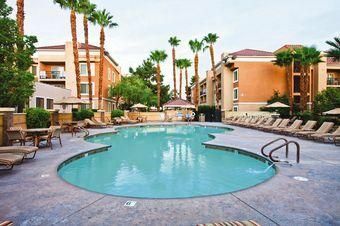 Desert Rose Resort puts you in the heart of the strip and walking distance to much of what Las Vegas has to offer. From exploring the massive, decorated, multi-million dollar casinos to hiking in Red Rock Canyon, to visiting innovations like the Hoover Dam, there are more activities than one could fit into a typical vacation. Take a look at the list below to see some of the various activities Las Vegas has to offer, and their location from Desert Rose Resort. Please note Desert Rose Resort follows green housekeeping policies and provides limited housekeeping services on the 4h day of stay. Reservations staying under 4 nights will not receive housekeeping service, however trash removal and towels are provided upon request.